If you are interested in one of our outstanding puppies, please fill out the application form. We will contact you soon after receiving your application. 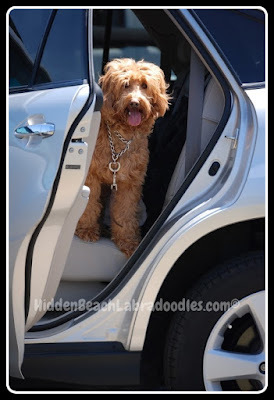 Hidden Beach Australian Labradoodles are $3000, regardless of the size, gender or color. To reserve a puppy, you are required to pay a $500 deposit. Your non-refundable deposit will be applied to the total cost of your puppy. We reserve the right to hold any pups for our breeding program. We will send out announcements when the puppies are born and emails with pictures and updates. The final payment will be required when the puppy is six weeks old. We will schedule a pick up day for the puppy at eight weeks of age. If the puppy can not be picked up on the agreed upon date, a charge of $50 per day will be added. We accept cash, money orders, or PayPal. If you choose to use PayPal, please note that 3% is added to your total. Your puppy may be picked up at our home. We would also meet you at our local airport if you chose to fly in to pick up your puppy. If you would like your puppy shipped to you in the United States, there is an extra shipping fee. Shipping fees must be paid 10 days in advance. After the reservations are made and a confirmation number has been sent to you, the shipping fee becomes non-refundable. If a puppy must be shipped, we offer the service of hand delivering your puppy to you. This is a service we offer to make sure that the puppy has a safe, happy trip. Please check with us for the individual fee.